Keeping a Little Home Cooking in my Heart! I don’t know about anyone else out there, but there is just something about church cookbooks that I love. It seems as though no matter what page I open it to, there’s some good recipe that I want to try. While there are a few things that seem a bit odd (I saw a recipe for pork and beans used in a dessert once), most of them are great, simple, hearty recipes that I usually have most ingredients for. This one is no different! 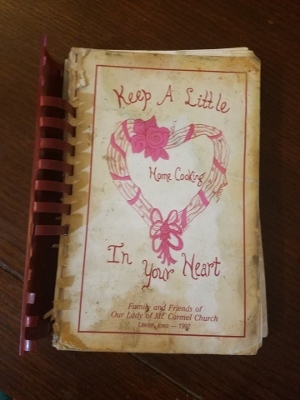 This cookbook is from the Our Lady of Mount Carmel Church in Lawler, Iowa. As you can see, it’s likely seen it’s better days, but this is the original that my mom bought when it first came out in the 90’s. When I was younger and would cook, Mom always yelled at me because I would slop whatever I was cooking all over the cookbook in question. This one was no exception! As you can see, there’s lots of little “love marks” all over! It was loved so much that a lot of the pages have even fallen out! A week or so ago, Jason requested tacos for supper with homemade shells. 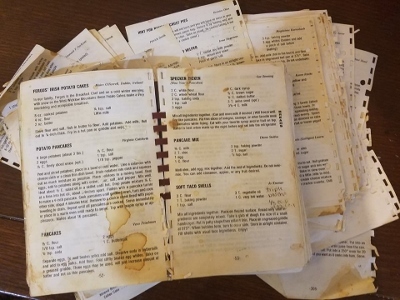 I knew that the recipe was in the Lawler cookbook as we call it, but because I knew that it was in a million or so pieces, I wasn’t sure if I had the page or where that specific page was. Luckily, I was able to flip to the bread section and find it pretty quickly! As you can see there, we made multiple batches of these when I was younger and I did a little experiment to see if there was another measurement for the 3 Tablespoons of vegetable oil when making a triple batch. When I was younger, I also remember giving mom a hard time about writing the recipe to take a “glob of dough the size of a small hamburger.” After I was razzing her about it, she asked me how I would have written it. I couldn’t think of a better or different way! Needless to say, I’m on the lookout for a new “Lawler cookbook,” but I’ll always keep this one around. I think those little “love marks” give it a little personality! This entry was posted in Uncategorized on December 21, 2016 by Kelli. A friend of mine makes fudge with a can of refried beans and it’s delicious. Yes pork and beans bars are very goodl Like a spice bar, you don’t taste the pork and beans. You could buy some page protectors at Wal-Mart or Staples, slide the pages in and then put them in a notebook. I have a few cookbooks that look like this too! Those taco shells are fantastic! I remember eating them at your house growing up, and they’re still my favorite. I’m so glad you shared this! That’s a sure sign of a good cookbook! Aren’t church cookbooks great?? Here’s a way to rescue a coil bound cookbook. Buy a 5 x 8 inch binder with photo sleeves from the office supply store. Slide each page into a sleeve. Voila! a new cookbook without loose pages. 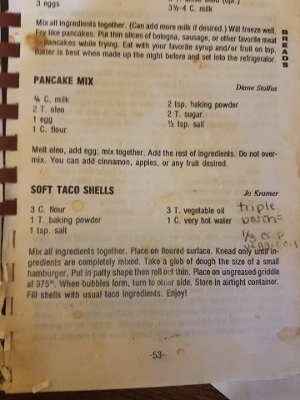 I jotted down the taco shell receipe and am going to give them a try…I never would have thought to make my own, but I have seen a machine making them while visiting in Texas. Better late than never.